Game of Thrones teaser released: Is science the answer? Game of Thrones season 8 teaser trailer is out. Does fire and ice create dragonstone? Is science the answer to the Game of Thrones puzzle? Winter has come to the UAE, but on social media, tweeps are using #AprilIsComing, after a short teaser of the much awaited final season of Game of Thrones was released online. 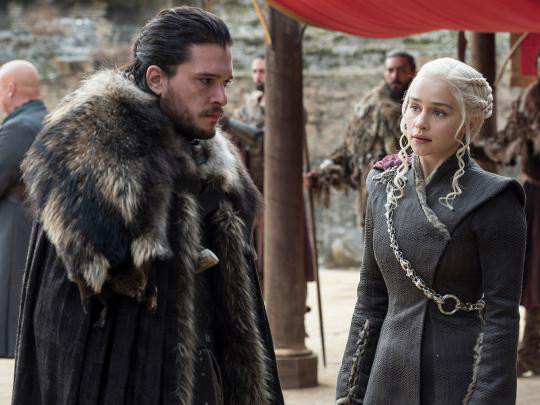 Uploaded by the official @GameOfThrones Twitter account, the 40 second clip dropped some major clues about the upcoming season finally, leaving fans in a frenzy. The trending video was uploaded on December 7 and has received 3.37 million views (and counting). In the teaser we see “fire and ice collide”, but it is not so simple. Why? It looks like fire and ice come together and create what we assume to be dragonglass – the nemesis of the White Walkers. In nature, glass is formed when sand or rocks, often high in silica, are heated to high temperatures and then cooled rapidly. Obsidian or volcanic glass is molten rock that has quickly cooled, becoming rock in a glassy state. Dragonglass is a common name in Westeros for obsidian. In addition to Valyrian steel, dragonglass is capable of killing a White Walker. Does this mean the White walkers will be defeated? Are the Lannister’s going to burn everything down? In season 7, Samwell Tarly discovers that a massive mountain of dragonglass could be found on Dragonstone, while researching on the White Walkers at the Citadel in Oldtown. Dragonstone is an island located near Blackwater, the ancestral home of House Targaryen before the conquest. He informs Jon of his find. When Daenerys Targaryen takes Jon Snow and Sir Davos prisoners at Dragonstone, Jon tells Tyrion Lannister of the dragonglass’ ability against the army of the dead. Daenerys Targaryen allows Jon to mine for it, whilst she concentrates on defeating Cersei Lannister. Fans were quick to share theories while wondering about the fate of their beloved characters. According to an article by British online newspaper, The Independent, “the actor who portrays the terrifying Night King has revealed that the battle will actually take place in episode three: right in the middle of the six-episode series.” The episode will be about an hour long. HBO's Game of Thrones season 8 is set to air in April 2019.